The New 5 Gallon Ball Lock Keg NSF Rubber Handle Set of 2(CKN5DRHINX-2PK) offers a versatile design ideal for dispensing a variety of beverages including beer, wine, or soda. These 5-gallon kegs feature Stainless Steel ball lock systems with durable top vulcanized rubber handles for easy carrying and positioning. They each feature a gas and liquid plug as well as a pressure release valve in the lid. A welded 304 grade steel construction offers a lasting durability while a black, hot vulcanized natural rubber bottom provides a soft base when stored. 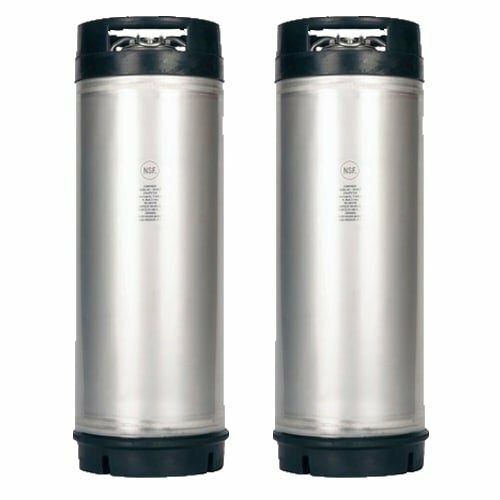 These kegs are fully NSF (National Sanitation Foundation) approved beverage safe, with ongoing compliance via NSF monitoring for highest food safety design and quality of materials used.Construction: These kegs are made with a welded steel construction and hot vulcanized rubber bottom and top handles for lasting durability and easy positioning. Plugs: The top of each tank is equipped with one liquid and one gas plug as well as a pressure relief valve. Versatile use: These kegs are ideal for storing and dispensing a variety of beverages including wine, beer, soda, or kombucha. If you have any questions about this product by ASI, contact us by completing and submitting the form below. If you are looking for a specif part number, please include it with your message.